Cut out the stumps. Only muffin tops here. This original creation is one of a kind for all the muffin lovers out there. This pan is also ideal for making large, perfectly shaped cookies. Its non-stick, easy release construction features the same attention to detail that made Chicago Metallic the preferred choice by bakers who understand quality, design and durability. Oven safe to 450°f/ 232°c; not intended to be used under the broiler. Sharp-edged utensils and knives should not be used. at Chicago Metallic, we believe that serious baking requires serious bakeware. That’s why we’ve been crafting innovative equipment, for professionals and serious home bakers, for over 100 years. We’ve built a global reputation one kitchen at a time. People know our products are built for durability and can be depended on year after year. We’re proud to offer three distinct lines of premium bakeware plus stylish, innovative specialty bakeware and baking essentials. The Chicago Metallic professional line of bakeware makes cooking and baking a delight. The non-stick surface easily releases each recipe and makes clean-up effortless. It’s the preferred choice of bakers who understand quality and design, but also want professional-grade durability. 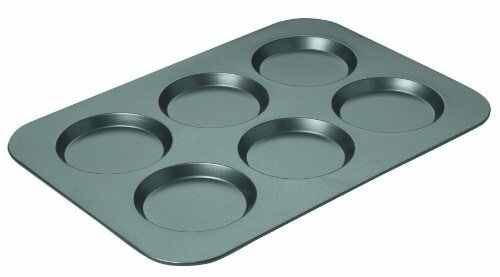 BAKE THE PERFECT MUFFIN TOPS: This non-stick muffin top pan has a shallow cup design that creates delicious muffin tops; each muffin well is 0.5" deep. This pan also bakes perfectly sized eggs, cookies for ice cream sandwiches, and small layer cakes! PREMIUM QUALITY, DURABLE AND LONG LASTING: The Chicago Metallic Non-Stick Muffin Top Pan is crafted from heavy-weight carbon steel for superior heat conduction and even baking. NON-STICK COATING FOR EASY RELEASE: The Chicago Metallic Non-Stick Muffin Top Pan features a non-stick surface. The non-stick coating calls for an exceptional baked good release and easy clean up. THE PERFECT SIZED MUFFIN PAN: This non-stick muffin top pan is the ideal size for all of your baking needs. The non-stick pan measures 15.75" x 11" and bakes up to 6 muffin tops. Each cup measures 4" x 0.5". DISHWASHER SAFE FOR FAST CLEAN UP: This muffin top pan is dishwasher safe, making clean up fast and easy however hand washing is recommended to extend the product life.